County of Merioneth Bettws-Gwerfil-Goch, Corwen (3), Gwyddelwern (3), Llandrillo (2), Llangar, Llansaintffraid Glyndydwy. Counties of Denbigh and Merioneth: Llanfihangel glyn y Myfyr. County of Denbigh Bryn Eglwys, Cerrig y Druidion (2), Glyn Traian, Llangollen parish (2), Llanarmon dyffryn Ceiriog, Llandisilio (2), Llangwm (2), Llansaintffraid glyn Ceiriog. The population falling within the Union at the 1831 census had been 10,404 with parishes ranging in size from Llansaintffraid Glyndydwy (population 60) to Corwen itself (1,980). The average annual poor-rate expenditure for the period 1834-36 had been £4,279 or 8s.3d. per head. 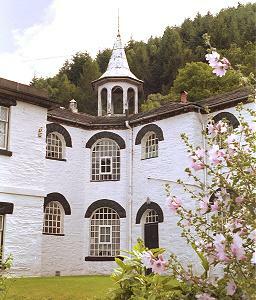 The Corwen Board of Guardians decided to build a workhouse to accommodate 150 inmates. It was to be located on one-acre site known as Ty Hiont Yr Aber situated at the east of the town "between the Turnpike and the town of Corwen" which was valued at £30. Until its completion, the Guardians held their fortnightly meetings in a room at "The Eagles". Plans for the new building were approved by the Poor Law Commissioners in June, 1837. Due to delays in completing the purchase of the land caused by its owner, Colonel Vaughan, construction was not completed until April 1840. The building work was carried out by John Boyle of Chester at a cost of £2,7310.10s. In August 1839, Boyle was paid £10 towards the cost of "moving the building several feet back towards the mountain". The main building had a cruciform layout with its entrance at the north facing onto the road. Its location and layout are shown on the 1901 map below. Corwen general view from the north-west, 2000. Corwen entrance from the north, 2000. The central supervisory hub contained observation windows giving a view of all parts of the inmates' yards. Corwen central hub from the north-west, 2000. 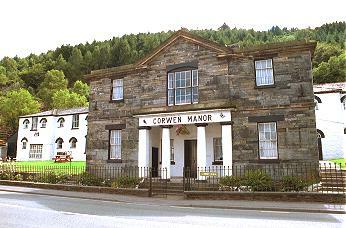 Corwen from the south-west, 2000. In 1894, a vagrants' block was erected on the opposite side of London Road to the workhouse. 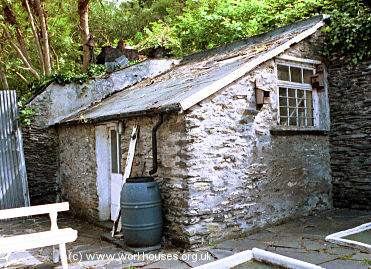 Corwen workhouse vagrants' block, 2000. On 25th April, 1842, the Guardians refused to obey a directive from the Poor Law Commissioners that the Workhouse purchase its bread from a particular local baker. A free supply of "heath" collected on the mountainside by the Workhouse children meant that they could bake their own bread more cheaply. Buying-in bread was, they considered, "a waste of this free child labour". In 1930, the establishment was taken over by Denbighsire County Council and was redesignated as a Public Assistance Institution. It closed in the 1930s although the casual wards continued in use into the 1940s. The site was sold off in 1946 and subsequently used for a variety of purpose including as a factory for engineering, seed production, and shirt-making. After falling into dilapidation, it was restored in the early 1980s and now houses a clothing and craft shop. Meirionnydd Archives, Ffordd y Bala, Dolgellau LL40 2YF. Holdings include: Guardians' minute books (1837-1930); Ledgers (1837-1930); Admissions and discharges (1912-13); Returns of births and vaccinations (1923-8); Letter books etc. (1839-49, 1861-71, 1875-1931); etc.